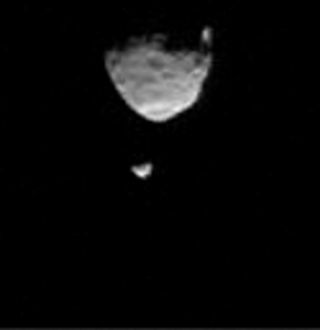 The moons of Mars, Phobos (top) and Deimos, are seen together in this image taken from the Martian surface by NASA's Curiosity rover on Aug. 1, 2013. A new study suggests Mars' largest moon Phobos may undergo a cycle of breaking into rings, then reforming. Mars might once have had rings — and might regain them over and over again, according to new research. A new model suggests that Mars' oddball moon Phobos might once have been rings around the planet, caused by a large impact about 4.3 billion years ago, and that as it approaches the planet it will be torn into a ring again. In the model, the debris from a large impact slowly spreads out away from Mars, clumping up to form a moon over time. Then, Mars' gravity begins to pull the moon toward the planet until the gravitational force is too strong, and the moon is ripped apart again, the model shows. The researchers said that that cycle might have already happened three to seven times, and that Phobos — currently getting closer to Mars — is the latest phase of the process. The model predicts that each newborn moon might be five times smaller than the previous one, and debris from the process might have coated Mars every time a new one broke up. That seemed like a good match for actual conditions found on the Red Planet: "You could have had kilometer-thick piles of moon sediment raining down on Mars in the early parts of the planet's history, and there are enigmatic sedimentary deposits on Mars with no explanation as to how they got there," said David Minton, one of the model's creators and a researcher at Purdue University in Indiana. "And now it's possible to study that material." The impact could have directly created Phobos as well, according to other theories, but Minton finds that unlikely; he said that the moon wouldn't have lasted all this time, and that it would have had to cross past Mars' other moon, Deimos, from further out and altered its orbit — but Deimos seems to orbit very close to Mars' equator, unaffected. To test the model, the researchers plan to study the dynamics of the planet's first set of rings or the debris that would have been left on its surface from generations of disintegrating moons. The new work was detailed today (March 20) in the journal Nature Geoscience.